Mrs. Wilson is out of the building today, so I have been tasked with writing the Words with Wilson this week. So, we will call this installment Words about Wilson! Sometimes God does things to help us understand how special life is and how thankful we should be for all the gifts he gives to us. God has presented me with another one of those opportunities this week. Mrs. Wilson has been a little under the weather and has not been here the past two days. I have been given the opportunity to walk a few miles in her shoes, and here is what I have learned from my experience. First off, she is much younger and has a lot more energy than me! I slept like a baby last night, and I have scheduled a nap for 2:00 o’clock today because the responsibilities of her job are immense. Second, I have a new respect for her ability to stay positive and keep smiling. Parts of her job are very taxing on the emotions and the patience. Yet, she is always upbeat and willing to deal with all challenges that come her way. ﻿Thirdly, I have no idea how she gets to all the school activities she attends. I had one place to be last night, Arnis, for the Dine to Donate, and I was not able to make it because of previously scheduled plans. She makes it to everything without fail, she is constantly attending something for the church or the school, and she makes it to everything! Most importantly, I have been reminded what a great person Mrs. Wilson is because although she is not feeling well she continues to text and email to make sure things are going okay and answers any questions. I hope she does call or text around 2:00 today! We are blessed to have her as our principal and friend! I hope everyone enjoys your weekend, and I encourage all of you to look for those moments in your life where God is trying to get you to realize the special things in your life. Thank you God for the opportunity you gave me these last couple of days! 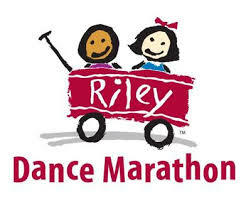 Several St. Roch alumni, who now attend Roncalli High School, will be participating in the Riley Children's Hospital Dance Marathon. St. Roch Catholic School will support their efforts by having a casual day on Thursday, April 11th . This is not a pre-paid day. We are asking that students bring at least $1 to participate. All money will being going to Riley Children's Hospital. Thank you for your support! 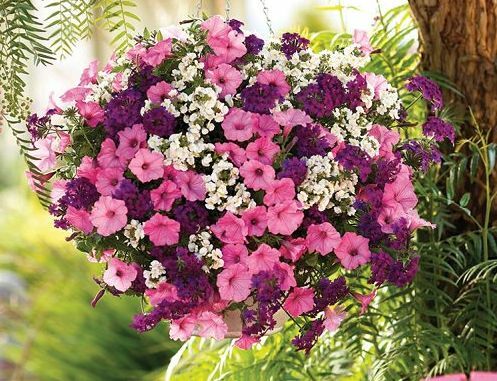 The St. Roch PTO is sponsoring a spring flower sale. Attached you will find an order form, and also pictures of what is being offered. Orders are due by Friday, April 12th. The pick-up date will be Saturday, May 11th, just in time for Mother's Day! We will send paper order forms with students later this week. All order forms should be submitted to the office. Please make checks payable to the St. Roch PTO. Thank you for your support of the St. Roch PTO! The St. Roch Men’s Club will be sponsoring two more Fish Frys during the our Lenten season. The remaining dates are April 5th and 12th from 4:30 to 7:30pm. Dinner includes main dish, 2 sides, dessert, & drink for $7.00. The menu includes:hand breaded fish, baked fish, shrimp, grilled cheese, cheese pizza, green beans, coleslaw, mac n cheese, fries, and onion rings. 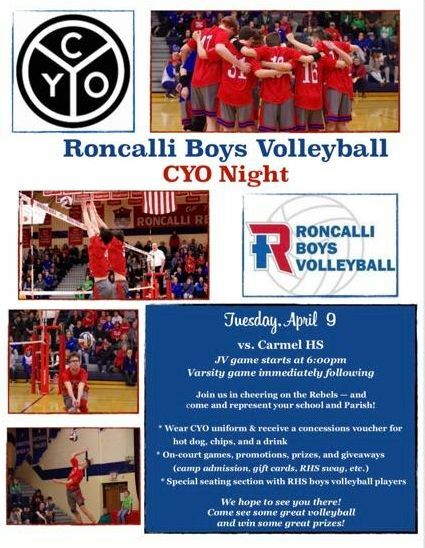 The Roncalli Women’s Lacrosse team is inviting you to enjoy CYO YOUTH NIGHT on Thursday, April 11th. The junior varsity game starts at 6pm. The varsity game starts at 7:30pm. The Lady Rebels take on Brownsburg in Rebel Stadium! All students in grades K-8 will get into the game for FREE and will get a free item at the concession stand and a chance to win a spot in the women’s lacrosse summer camp. Be sure to wear your school spirit wear! Come out and experience the excitement of Women’s Lacrosse!